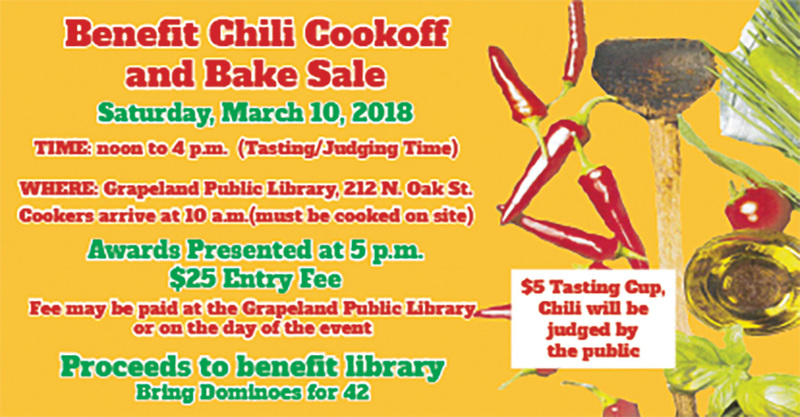 GRAPELAND – A chili cook-off and bake sale benefiting the Grapeland Public Library is set to take place Saturday, March 10 from noon to 4 p.m. at the library, which is located at 212 N. Oak St. in Grapeland. According to library representative Harry Pridgen, those wishing to enter the chili cook-off will need to arrive at the library no later than 10 a.m. An entry fee of $25 may be paid at the door. All chili entered in the cook-off must be cooked on site. Awards will be presented to the winners of the cook-off at 5 p.m.
Pridgen said the library has received more than 20 commitments for cakes and pies to be provided for the concurrent bake sale. “We’re going to designate some cakes and possibly pies to be sold by the slice to the public,” he said. Also taking place during the event will be a rummage sale. “This will be a special opening for the sale,” said Pridgen, explaining that the sale is typically held during Memorial Day weekend and Labor Day weekend. Donations for items to be placed in the rummage sale are being accepted, Pridgen said. Monies raised March 10 will be used to assist with the library’s upcoming projects such as the annual summer reading program. Those attending the event will also have the opportunity to play games of 42 and are encouraged to bring dominoes to do so. For more information, contact the Grapeland Public Library at 936-687-3425.